Sherri Hall's 35 years working with animals has led her through experiences starting in her teenage years supervising horse camps, rescuing/rehabilitating wildlife, educated as a veterinary technician, to operating a successful kennel, breeding, boarding and training facility. Sherri is the owner of Bye Bye Birdie Goose Control, Elite Detection Dogs, Maplelane Farm Event Centre, all a division of K9 Pest Management Group, along with Maplelane Golden Retrievers. Bye Bye Birdie works with clients to develop customized programs for animal and goose control services as well as holding the municipal animal control contracts for New Tecumseth, Town of Innisfil, Town of Georgina, Town of Newmarket and Town of Whitchurch-Stouffville. 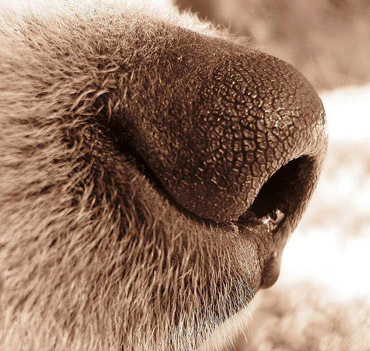 Elite Detection Dogs provides sales and services for detection of bedbugs. Her success is not only attracting attention, it is receiving recognition; she won the South Simcoe Business Excellence award in 2008, Entrepreneur of the Year. Sherri has been nominated by our local RBC branch for the prestigious RBC Women's Entrepreneur of the Year for the past several years. Elite Detection Dogs holds some of the largest municipal housing contracts in the region. 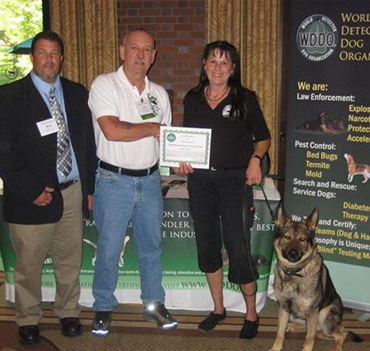 In addition to being one of the top detection dog companies in Southern Ontario, Sherri also is a certified WDDO trainer (1st in Canada) and an official Noseworks judge with the UKC. Meet The Trainer con't . . . .
Maplelane Farm Event Centre offers a variety of spaces for dog training and events. CGN Testing, Disc and lure coursing fields, dock diving, barn hunts and other dog sport events. Located in South Simcoe, our fully insured venue, with over 4 fenced in acres, offers hydro and running water, ample parking, portable toilets, separate off-leash toileting area and a show grounds office. Maplelane Farm Golden Retrievers is a licensed breeding/training/boarding kennel in New Tecumseth, Ontario and supporter of COPE Service Dogs. For over twenty years, Maplelane Farm has bred and continues to breed breeds Golden Retrievers, Labrador Retrievers, Belgian Malinois and Border Collies. Maplelane is also a licensed municipal shelter and operates an all-breed rescue. Certified Animal Disaster First Responder "Pet Safe Coalition Society of Canada"
Certified in "Airport Wildlife Management"
Certificate of Attendance "Ontario Provincial Police K9 Search & Rescue"
So you're considering a K9 Inspection Service?